“Nothing can be so amusingly arrogant as a young man who has just discovered an old idea and thinks it is his own” — Sidney J. Harris. Credit is older than money. The money you see in your pocket is less than a few hundred years old. The Euro is just 16 years old while the US dollar is only 170 years old. World history is nothing but a story of debtors and creditors, and the roots of credit and lending can be traced back to the origins of civilization itself. Written loan contracts from Mesopotamia that are more than 3,000 years old show the development of a credit system that included the concept of interest. However, the earliest records go all the way back to Assyria and Babylonia, where merchants at the time made grain loans to farmers and traders. The mechanisms in place were pretty sophisticated, even by modern standards, with lenders accepting both deposits and acting a little like a “bureau de change” (Read some history here). In 1780 BC, the Code of Hammurabi defined a framework for lending during pre-historic times. What has changed over thousands of years are tools and the medium- i.e. the means to acquire, deliver, assess, and contain risk. Risk-based pricing is not new to the world. Since the days of a guarantor-based loan to the days of collateral-based lending (house, gold, ornaments), lenders have always figured out a method of risk assessment. Even though it is 4000 years old, the code of Hammurabi talks about rate-caps to prohibit usurious and predatory lending. The new risk models have to be subjected to various credit cycles to test the robustness. More raw data is not equal to more insights. Much has changed in the banking landscape with regulation, changing customer expectations, technology, demographics, greater competition, legacy business, and operating models. Lending and risk are inter-linked but are two very different things. The most important point that often gets ignored in this continuous “noise” and fancy vocabulary — of FinTech, AI, big data, and Alternate finance — is a deep understanding of the credit-risk and credit cycles. Here it is important to understand that only the medium is undergoing a change, neither lending nor the inherent risk has changed fundamentally. Credit Losses + Costs (OPEX + Costs of Funds) < Interest Income. If the above equation is maintained, and capital protection is ensured, then the business will continue to grow. The key is to maintain the lowest cost of capital and risk with the highest volume possible. Although we are witnessing a lot of innovation in the acquisition model by the “layer players”, a vast majority of digital lending platforms are just ‘marketplace or aggregation platforms’, and only a small minority of them are ‘balance sheet’ lenders. It is very likely that Facebook, Google, and Amazon will also start participating in origination, distribution, and fulfillment of financial products. In that scenario, are “non-balance sheet aggregators” ready to face these giant global tech and commerce platforms? Long lasting and sustainable differentiation in credit is only possible through proprietary risk models. However, no existing digital finance companies or platform has undergone a full credit-cycle. Hence, with limited datasets and performance metrics, their credit risk and pricing models are still untested. The underwriting standard and risk management framework deployed by most of the digital finance players is also unclear. Consumer debt is the lifeblood of any economy. Credit fuels consumption and commerce. Lenders funded grain shipments in ancient Athens and backed the new merchants of Italy and England. They supported Spain’s exploration of the new-new world and made possible the successful colonization of America. Bank credit fueled the industrial revolution, supplying the necessary capital to the new entrepreneurs in the late 20th century. Lending institutions have provided billions of dollars to finance the technology, communications, and healthcare industries. All modern nation-states are built on deficit spending. Without capital, such life-enhancing industries would not exist and home-ownership would be impossible to all but the wealthiest people. Having said that, both bank credit and non-bank credit are subject to credit and economic cycles. Managing credit risk is always a complex challenge, one that becomes even more complex against a backdrop of market volatility and ever-changing regulatory guidelines. Loans extended on “easier” terms during expansions return to haunt the lenders as “problem loans” during contractions. The credit cycle is the most powerful force in finance. The benefit of all this operational and risk innovation (by digital lenders) is that it may lead to proven, sustainable, and superior metrics as compared to those of traditional lenders. For some (in the current lot) digital (balance sheet) lenders, the operating metrics are better than a branch-based cost model. But that’s a no-brainer. In India, during 2009–2011, most retail banks were running credit-losses around 7%-8%, and some as high as 15% portfolio at risk on their unsecured loan book. The losses in China’s P2P lending portfolio are as high as 8–14%. To get some more perspective, study the risk-indicators and loan-loss figures for significant digital finance players such as Lending Club and Prosper. Lending companies and banks have to manage their losses and operating expenses within that spread. I‘ll write more in a separate post on how risk assessment tools and applications work in an increasingly data-driven environment, and steps the incumbent lenders can take to leverage and improve their existing models. Money supply and leverage in the world. Since 1981, we are in an expansionary cycle. The “broad money” supply has increased by $30-trillion in the last seven years. 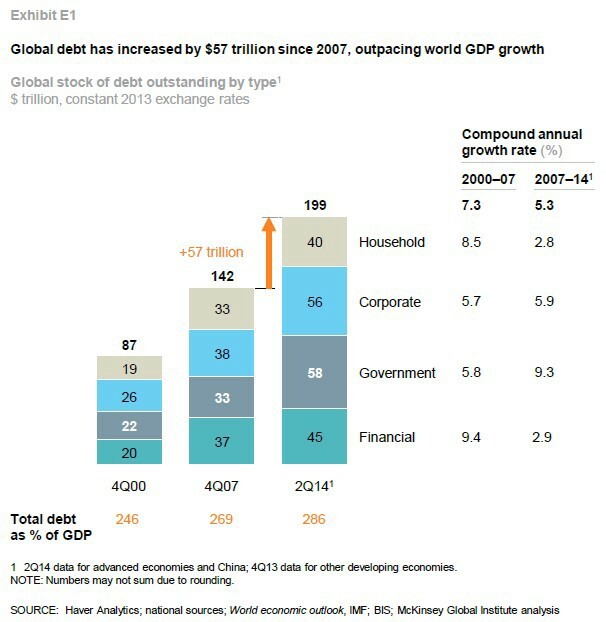 The debt leverage in the world has grown by $57-trillion since 2007. This poses some new risks to financial stability and will undermine global economic recovery and growth. There is too much leverage in the world now. The world over, central bankers and governments have been printing money. Since 1982, we are in a massive asset inflation cycle. The fact that government yields have peaked out, and bonds, real estate, and stock markets have all rallied is a powerful sign. Today, we live in a world of “decelerating economic” growth and “accelerating productivity” growth. With bank lending remaining constrained due to new regulations, non-bank credit is growing. No wonder, the rapid growth of shadow banking in China also is a huge concern. Powerful forces — customer expectations, technological capabilities, regulatory requirements, demographics, and economics — are creating an imperative for the retail banking industry to change. Predictably, there is a lot of action happening in the FinTech space which tech media sometimes celebrates as the birth of “bank slayers.” While it is nice to celebrate innovation, it is also necessary to put things in perspective by ‘stepping out of the frame’. 1) Since 2010, digital banking startups around the world have received only $20 billion in funding (as per CBInsights). Majority of these digital lending startups operate as an “intermediary” platform, and only a very small number operate as “balance sheet” lenders. 2) In 2015, the total money spent on IT-related costs, by all banks worldwide, was approximately $190-billion. 3) In 2014, banks earned a net income of $1-trillion on an equity capital of $10-trillion, and 40% (i.e. $400bn) of this net income was in form of credit interest income alone. Many have predicted the death of incumbent banks while suggesting that disruptive new digital lenders will start offering a better customer experience through new products and channels. It'll immensely help if media echo chambers, practitioners, and influencers exhibit some maturity and start thinking of FinTech ventures and banks as collaborators, working towards providing superlative customer experience and credit access to billions of unbanked people in a very cost-efficient way. Rather than play the “FinTech vs. Bank” game, I think, it is time to collaborate strategically and create greater economic value for the world. It‘s time’ to put the consumer back at the center of this new paradigm. Think Customer First. Thank you for reading! If you like this article, please “clap” and share it with your friends and network. It’ll help other people discover the story. Bots, Chat, Voice, Zero UI, and the future of Mobile Apps.